A handful of people gathered Wednesday before an unmarked grave in Lincoln Cemetery for a quiet ceremony to honor Rufus "Tee-Tot" Payne, the black musician who Hank Williams said was not only his friend, but his musical mentor. "We could be standing on his grave now," Womack said, looking at her feet. "At least we finally know around where he is buried." 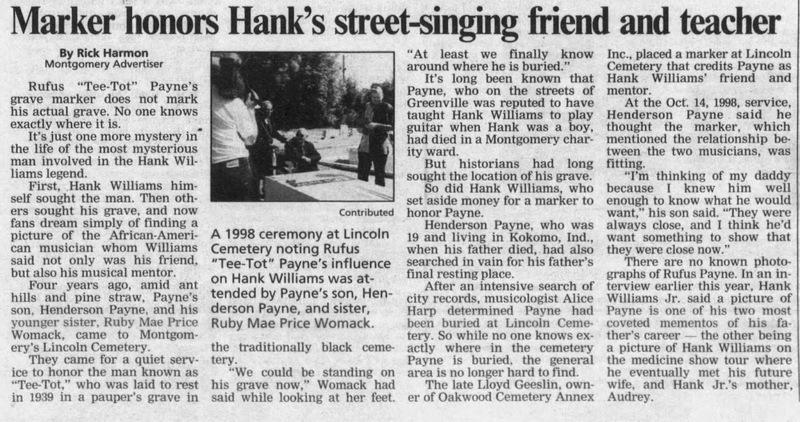 Historians had long sought the location of Payne's grave site, as had Hank Williams, who had set aside money for a marker to honor the man he said taught him his musical style. Henderson Payne, who stood before his father's grave site for the first time Wednesday, had also tried to find his father's burial place. I down came Womack three or four times trying to find it," said Payne's 78-year-old son, who was 19 and living in Kokomo, Ind., when his father died in 1939. "But no one knew where (the grave) was." Fans should have less trouble finding the area in the future. Lloyd Geeslin, who owns the Oakwood Cemetery Annex where Hank Williams is buried, has had a commemorative marker created that will be placed at Payne's grave. Geeslin has offered to have another marker for Payne placed by Hank Williams' grave. There was some disagreement about whether a second marker should be placed by Williams' grave, since it might give people the wrong idea that Payne is buried in Oakwood or take away from the other marker which will be at Lincoln Cemetery. But Henderson Payne said he was leaning toward having both markers. "I'm thinking of my daddy be-cause I knew him well enough to know what he would want," Henderson Payne said. "They were al-ways together. Wherever he went, people would say 'there's Tee-Tot and that white boy again.' They were always close, and I think he'd want something to show that they were close now." Geeslin said he'd like the second marker near Williams' grave because people should realize the link between the two men. "Wherever you find Hank Williams, you find Rufus Payne," Geeslin said. "Rufus Payne was why Hank's music was so different, why Hank could step on stage and make people go crazy." Montgomery historian Mary Ann Neeley, executive director of the Landmarks Foundation that oversees Old Alabama Town, said the discovery of the location of Payne's grave site was an important one. "People have been searching for his grave for around 30 or 40 years," she said. 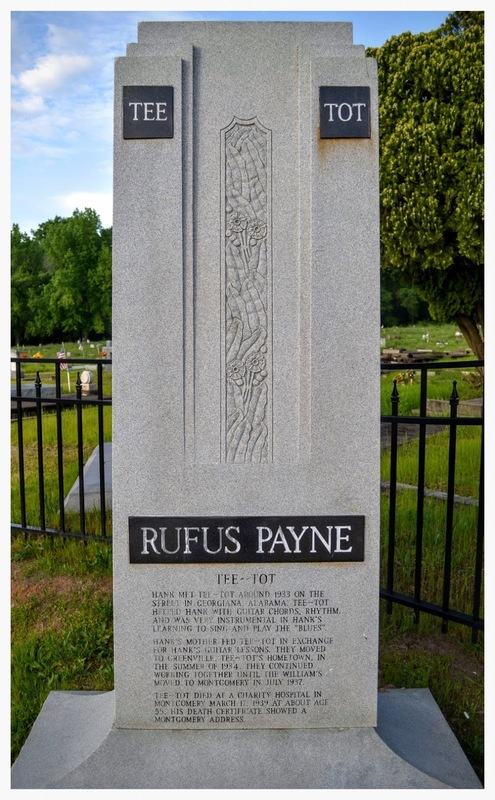 "Hank Williams is one of the subjects we are asked about most frequently at Old Alabama Town, and I think this will increase the interest in Rufus Payne, and who he was." Who Payne is a question that has long intrigued Montgomery historian Alice Harp, who located Payne's grave after a four-year search. Harp, who had researched such area blues legends as Big Mama Thornton and Johnny Shines, said l the key in finding the grave's location was doing often tedious work in checking through records and going beyond musical lore to historic fact. She said it's always been known that Payne had a huge impact on Williams' music. "I've heard a radio interview in which Hank Williams was asked who his influences were, and he said 'Rufus Payne was my only musical influence,' she said. But Harp said it appears the relationship between Tee-Tot and Williams was longer and more important than was realized. Many sought the location of Payne's grave in Greenville, where according to Williams' lore, Payne was a street musician who taught Williams to play when the country singer was a boy. 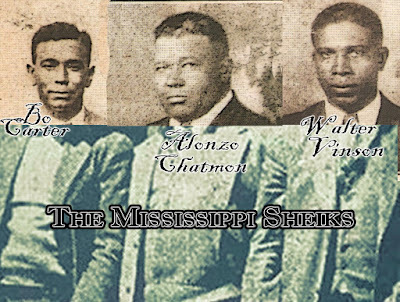 But Harp sought the grave in Montgomery because she discovered information that convinced her Williams had brought Tee-Tot to the city to join him. She said a 1939 city directory showed Rufus Payne living on South Bainbridge, just a few blocks from the boarding house that Williams' mother, Lillie, ran on South Perry Street. But Payne's final resting place is only one of the many mysteries about the man who taught Hank Williams about music. No picture is known to exist of Tee-Tot, and both Harp and Payne's relatives say written information about the musician may be both incomplete and inaccurate. "We're not talking about a man who sharecropped, wore overalls and sat on the curb and sometimes f played some blues," Harp said. "Payne was a professional musician." She said although Payne did sometimes play on street corners, that was because he played almost everywhere. She said he usually dressed in coat and tie, wore a tuxedo jacket to play piano at the par-ties of wealthy whites and played not just blues, but country, jazz and Cajun music that he learned growing up in New Orleans. "He was an educated man who insisted that his children also be educated," Harp said. Henderson Payne said blues wasn't even his father's favorite type of music. "He liked playing hillbilly music more than he liked playing the blues," his son said. "When he played hillbilly music he got paid. When he played the blues, he played for free." Harp said she has already sent in the paperwork to have Payne's grave designated a historic site. She is continuing to research Payne, an endeavor in which she said Hank Williams Jr. has been very supportive. Harp "is glad that Payne is finally getting the credit that his father always wanted him to have." The Montgomery Advertiser, Dec 31, 2002.